Looking for a modern, unique reception sofa? 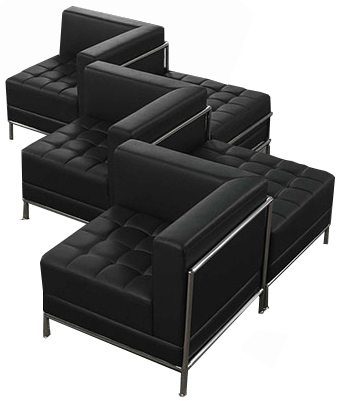 Our Black Tufted Modular 5-Seat Zig Zag Sofa stands out from the crowd! This sofa is part of a contemporary modular lounge series where you can mix and match components to build eye-catching, one-of-a-kind layouts. Upholstered in a commercially rated tufted black vinyl with chrome metal frame and legs. Upholstered and finished on all sides so you can have a beautiful focal point in the middle of your lobby or waiting area. Free Shipping! 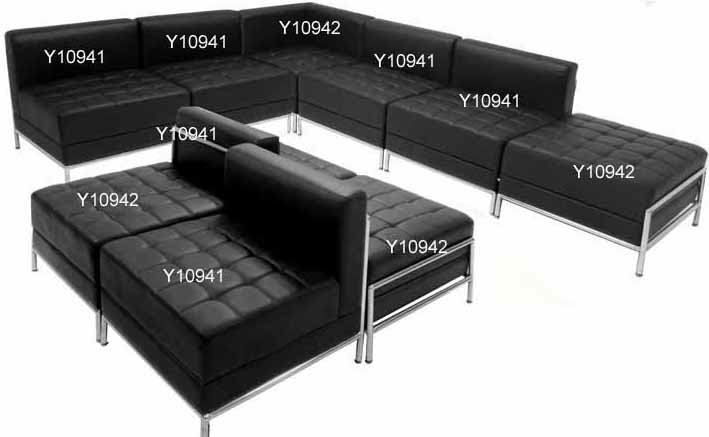 Black Tufted Modular 5-Seat Zig Zag Sofa sold above. See separate components & other configurations sold below. IN STOCK! 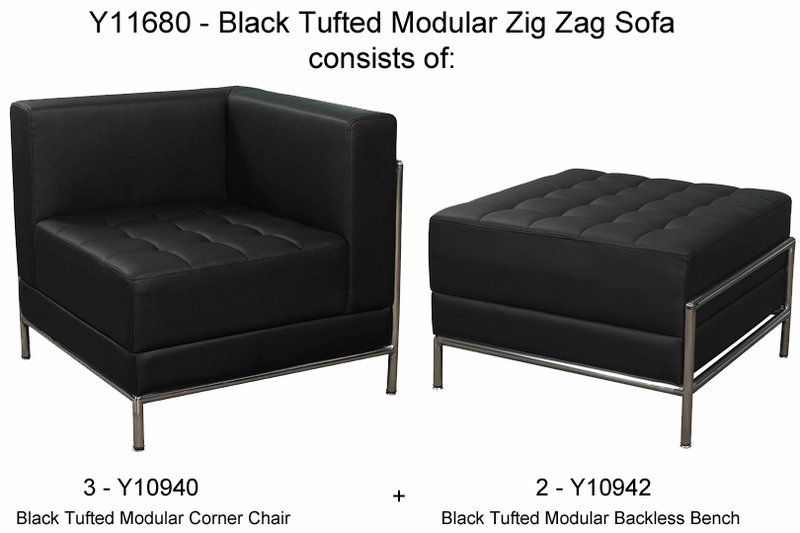 Black Tufted Modular 5-Seat Zig Zag Sofa is a package made up of three, Y10940 Black Tufted Modular Corner Chairs and two, Y10942 Black Tufted Modular Backless Benches. Requires a square area of 87" x 87". Diagonal length measures 123". 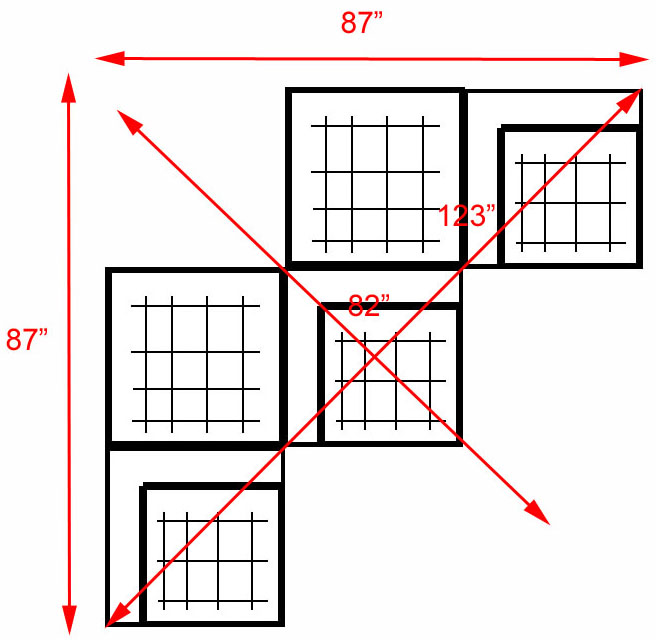 Diagonal width measures 82". Chairs ship fully assembled! Shipping weight 199 lbs. PRICE INCLUDES SHIPPING! (Truck shipment - see Terms & Conditions). * Modular design lets you use the chairs independently or you can build your own unique layout with multiple chairs. * All chairs upholstered on all sides with durable black vinyl rated for commercial usage. * "Buttonless" tufts are stitched in rather then held in by flimsy buttons that pop off and get lost. * Chrome metal chair frame & legs. * 250 lb. weight capacity per chair! * Seat cushions use 3" of thick, durable foam over plywood inner box frame, so chair seats will not bottom out. * ANSI/BIFMA rated for use in commercial reception settings. * 5 Year Limited Warranty. * Each section ships fully assembled! 1 - 3 $469.00 ea. 4 - 9 $439.00 ea. 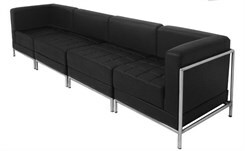 Upholstered in a commercially rated tufted black vinyl with chrome metal frame and legs. Corner chair features backrests on two sides of the chair with a chrome frame and feet. 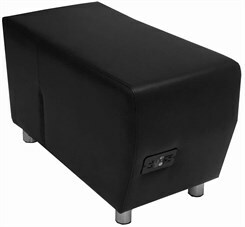 Can be used as a corner of a configuration or as left or right section of loveseat, sofa, etc. Measures 29"W x 29"D x 22-1/2"H overall. Seating area is 22" x 22" x 16-1/2"H. Finished on all sides and ships fully assembled. Shipping weight 45 lbs. PRICE INCLUDES SHIPPING! (Truck shipment - see Terms & Conditions). IN STOCK! 1 - 3 $449.00 ea. 4 - 9 $419.00 ea. 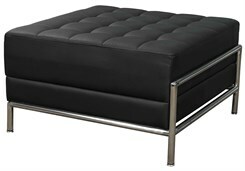 Upholstered in a commercially rated tufted black vinyl with chrome metal frame and legs. Temporarily sold out. Available to ship Early May. Order Now! Armless chair features a single backrest with chrome frame and feet. Can be used individually or used with other module units to create a multi-seater. Measures 29"W x 29"D x 22-1/2"H overall. Seating area is 22" x 22" x 16-1/2"H. Finished on all sides and ships fully assembled. Shipping weight 39 lbs. PRICE INCLUDES SHIPPING! (Truck shipment - see Terms & Conditions). 1 - 3 $339.00 ea. 4 - 9 $319.00 ea. 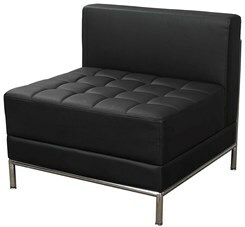 Upholstered in a commercially rated tufted black vinyl with chrome metal frame and legs. Use as bench seating or as extension to the Corner Chair or Middle Chair. Measures 28"W x 29"D x 16-1/2"H overall. Finished on all sides and ships fully assembled Shipping weight 32 lbs. PRICE INCLUDES SHIPPING! IN STOCK! Consists of two Black Tufted Modular Corner Chairs. 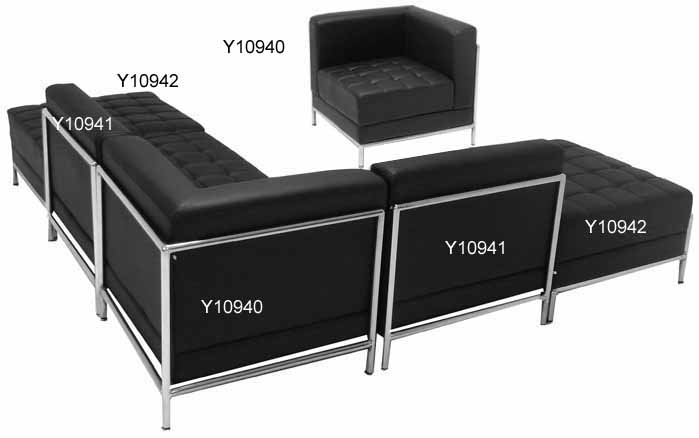 Upholstered in a commercially rated tufted black vinyl with chrome metal frame and legs. Measures 58"W x 29"D x 22-1/2"H overall. Each section ships fully assembled. Shipping weight 64 lbs. (Truck shipment - see Terms & Conditions). PRICE INCLUDES SHIPPING! IN STOCK! 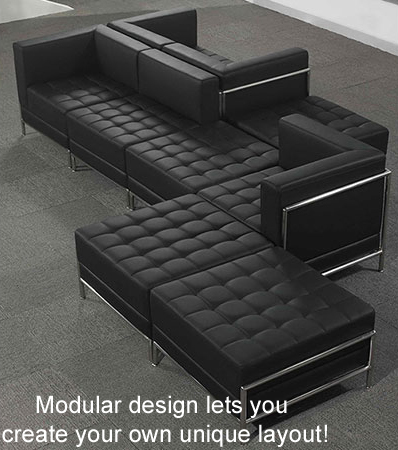 Consists of two Black Tufted Modular Corner Chairs and one Black Tufted Modular Armless Chair in center. 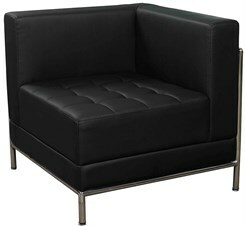 Upholstered in a commercially rated tufted black vinyl with chrome metal frame and legs. Measures 87"W x 29"D x 22-1/2"H overall. Each section ships fully assembled. Shipping weight 103 lbs. PRICE INCLUDES SHIPPING! (Truck shipment - see Terms & Conditions). IN STOCK! 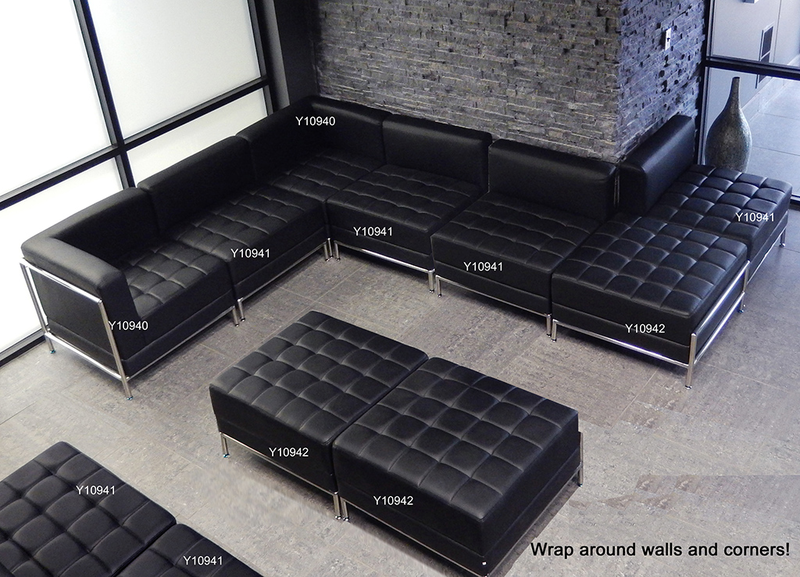 Consists of two Black Tufted Modular Corner Chairs and two Black Tufted Modular Armless Chairs in center. Temporarily sold out. Available to ship Early May. Order Now! 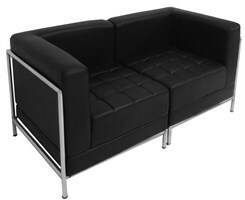 Upholstered in a commercially rated tufted black vinyl with chrome metal frame and legs. Measures 116"W x 29"D x 22-1/2"H overall. Each section ships fully assembled Shipping weight 142 lbs. PRICE INCLUDES SHIPPING! (Truck shipment - see Terms & Conditions). 4 - 9 $369.00 ea. Complementary 90 degree bench/connector table features one power outlet and two USB charging ports. Can be used in front of Convex/Concave components, or, to fill a corner spacing the club chair, 2-seater or 3-seater appropriately. 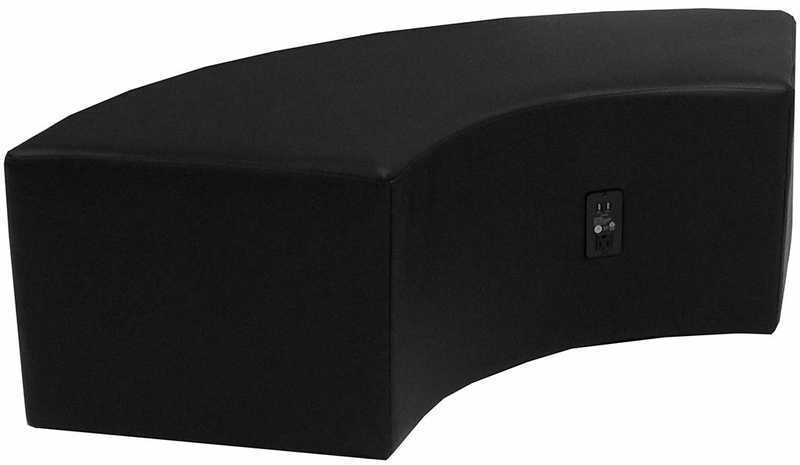 Provides both a needed charging station plus a convenient surface for magazines. 5' power cord exits rear of bench. Measures 58" from corner to corner x 22"D x 17"H overall. Shipping weight 37 lbs. PRICE INCLUDES SHIPPING! (Truck shipment - See Terms & Conditions). IN STOCK! 1 - 3 $169.00 ea. 4 - 9 $159.00 ea. A flexible must have piece for your reception area. Provides one power outlet and two USB charging ports. Fits neatly between or next to any item from this series. Also serves as a handy magazine table. 4' power cord exits rear of bench. Either Dark Cherry color block style feet or chrome finish cylinder feet - both sets included. Measures 14-1/2"W x 32"D x 18"overall. Shipping weight 23 lbs. PRICE INCLUDES SHIPPING! IN STOCK!